Maybe it’s because I love the book Scarecrow Pete , or maybe it’s because I grew up watching Wizard of Oz . Either way, I think scarecrows are fun. When I see scarecrows start popping up in seasonal decor, I just have to smile. We love crafting for the seasons, so I thought I’d share a scarecrow paper plate craft with you. This one is fun and allows room for creative expression. Paint your paper plate with your tan colored craft paint and let dry. Cut a triangle out of your orange card stock and glue to the center of your paper plate. Glue to googly eyes above the triangle. Use a paint brush and black paint or a black Sharpie to draw a wavy mouth and an outline around the nose. Paint or draw dashes through the mouth and outlines nose and paint 2 small circles on the side of the mouth to look like cheeks. Cut 2 sets of about 10 pieces of raffia about 5″ long and tie with another piece in the center. Glue the raffia to each side on the top of the paper plate. Cut a 5″ piece of burlap off and fold in half to look like a triangle and another 8″ piece in half and glue to the top of the plate to look like a hat like pictured. 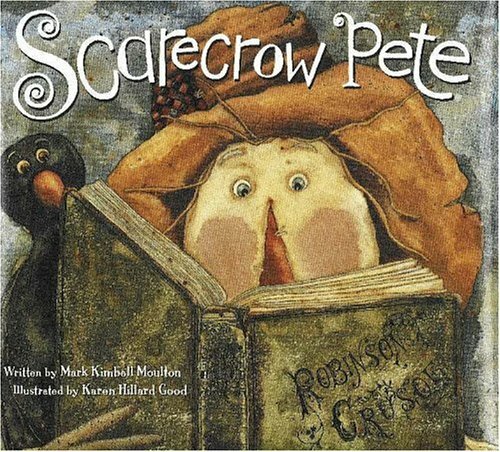 I mentioned that I love the book Scarecrow Pete. It’s a tremendously fun book! Scarecrow Pete is no ordinary scarecrow! He’s a straw-filled dreamer who uses books to transport himself to new places. When a visitor discovers him, the two use books to travel and experience new lands and explore. Scarecrow Pete is sure to become a fast family favorite. Grab your copy today!